The Drake HDE24A high-definition encoder module generates an MPEG2 or MPEG4 (H.264) video stream, with Dolby® AC3 or MPEG1 layer 2 audio. This module is designed to be installed into Drake’s EH24A or MEQ1000B-style chassis which provides the control and output interface to the unit. This configuration of encoder module and host chassis provides the ultimate in bandwidth management and economy by allowing multiple HD and SD streams to be multiplexed together dependent upon the limitations of the bandwidth of the chosen output: QAM and/or ASI (see EH24A and MEQ1000B manuals for more information on multiplexing). 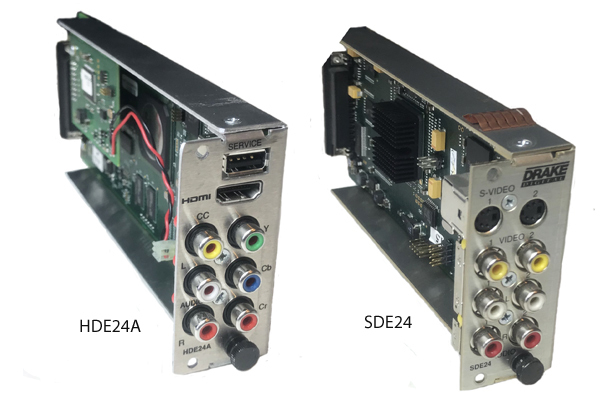 The HDE24A high-definition encoder accepts non-encrypted HDMI or component video inputs and can inject closed-captioning data from a synchronized composite video source (typically provided by the same decoder that produces the HD video stream). Composite analog audio inputs provide the audio source when component video inputs are used. Typically HDMI has embedded audio but if the HDMI is derived from a source converter that does not provide audio, such as DVI-to-HDMI, then the analog composite inputs may be used.